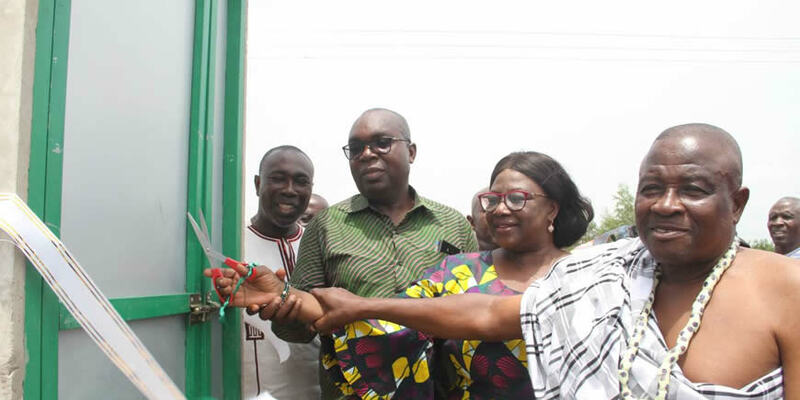 The Volta River Authority (VRA) has commissioned and handed-over 30 bio-digester lavatories to the people of Dzebetato in the South Tongu district in the Volta Region. The facility, which was constructed by Biofilcom, at the cost of GH¢ 150,000 forms part of the Authority’s corporate social responsibility (CSR). In her speech, Ms. Shirley Seidu, Director, General Services, said the gesture was to help address the menace of bilharzia in the impacted communities and improve on the health of the people. The Chief of Dzebetato, Togbe Kofi Akpli IV, commended VRA for the initiative and promised to take good care of the facility. Present at the event were Mr Emmanuel Louis Agama, District Chief Executive, South Tongu District Assembly; Mr Samuel Fletcher, Manager, Corporate Social Responsibility; Mr. Ulysses Ocran-Hammond, Manager, Lower Volta Dredging and Aquatic Weed Harvesting Project, VRA; Mr Denis Buabeng, Project Engineer, Biofilcom and staff of VRA.